The Cavallerizza Ducale is located in the old city center of Sassuolo, a small city on the provincial border between Modena and Reggio Emilia, which has gained acclaim worldwide thanks to its famous industrial district for the production of ceramic tiles. However Sassuolo not only boasts a manufacturing tradition, now synonymous with innovation and cutting edge technology, but is also host to a remarkable heritage of historical buildings, gardens and residences dating back to past eras. The Cavallerizza Ducale takes us back to the times of the Estense Duchy when the noble family governed in this area of Emilia. In fact the Cavellerizza Ducale was built between 1781 and 1788 on commission by Duke Ercole Rinaldo III to remedy the lack of stables and lodgings for the “Dragoni Ducali” (armed corps) that followed the Estense Court when moving to the palace in Sassuolo. This building was part of the “Delizia Estense” (Estense Delight) together with the Palazzo Ducale of Sassuolo and the surrounding buildings, used as the summer residence. 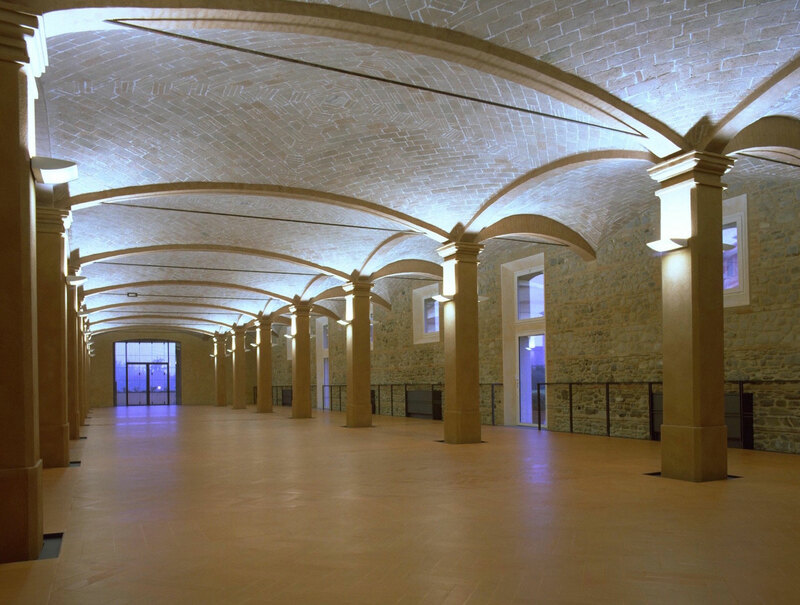 New life has been given to the Cavallerizza Ducale, which as well as being used for community and cultural initiatives, has also become the elegant and original headquarters of Studio Pincelli & Associati, which together with Franco Stefani, were the actors in this ambitious restoration project, started in 1991 and completed in 1998. Behind this restoration work hides a story of passion and love for the city of Sassuolo. A gesture of respect and sign of deep attachment to this area, which occupies an important place in the hearts of its benefactors, who through the restoration of the estate, aimed at restoring dignity and magnificence to one of the most fascinating buildings of the city. The architectural restoration of the Cavallerizza Ducale hides another important aspect: the desire not only to restore ancient walls and bricks for a question of appearance, but also the wish to restore the social value of the building, to become a reference point for all those living in Sassuolo. The functionality regained through this work make the building an integral part of the city scene, where people can meet and socialise.